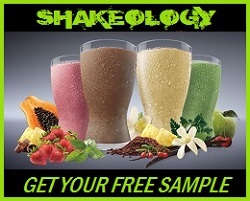 As many of you know, about four or five months ago, Beachbody updated their Chocolate Shakeology Formula to include quite a few new superfoods in addition to changing out some of the fructose sweetener with Stevia and cocoa. This no doubt was a more superior to the prior Chocolate Shakeology on a completely nutritional level, but as many of you also know, it came at the cost of flavor. There was a giant backlash and many of you even cancelled your Home Direct orders. I was pretty ticked off myself! Its not that I didnt like the flavor, but it just didnt have the sweetness to it anymore that made it pretty much like chocolate crack! Where as I used to look forward to drinking Shakeology every single morning for breakfast…with the new superfood formula, I could take it or leave it honestly. I continued to drink it simply because of the fact that I know how good it is for you and I didnt want to give up a supplement that did so much for my body and health. 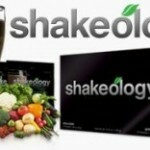 I even switched to Tropical Shakeology for a while which was a nice change of pace! 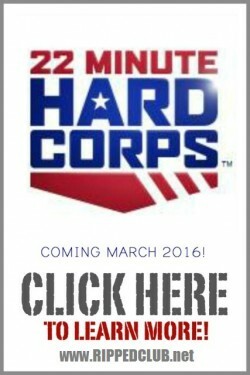 But Beachbody has heard you! And in their commitment to quality, and customer satisfaction, they have developed a “customer approved” Chocolate Shakeology that is getting rave reviews! You missed the old stuff. So we created some new stuff. Plain and simple. 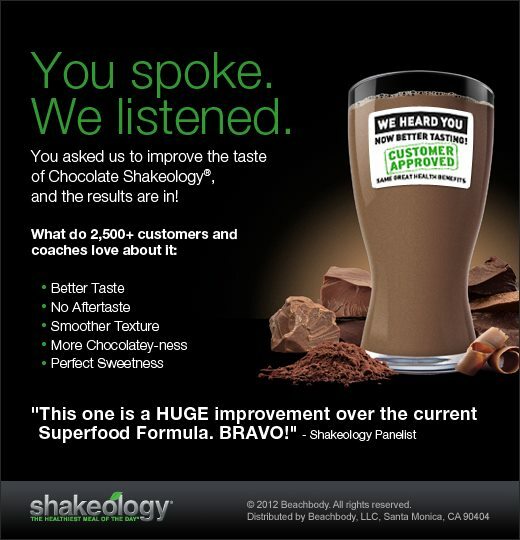 “When you—our biggest fans—gave your feedback on the new Chocolate Shakeology formula last summer, we took it to heart. Then we took action. We immediately went back to the drawing board and found a way to drastically improve the flavor and aroma—without compromising any of the 70 ingredients or new Superfoods. There’s still less sugar and more fiber. And it’s still, by a thousand miles, the Healthiest Meal of the Day. To make sure it wasn’t a fluke, we put this new flavor to the test with over 2,500 taste-testing panelists—which included both Coaches and customers. And it passed with flying colors. Panelists approved the flavor on FIVE key dimensions: Aroma, taste (especially aftertaste), sweetness, chocolaty-ness, and texture. Now for the best part: It’ll be 100% available to you starting this week on December 21st. And for everyone already on Chocolate Shakeology HD, you don’t need to do anything. You’ll receive the new stuff in your next shipment. Q: What’s different about the new Chocolate Shakeology formula? A: Our team focused its improvements around five key sensory aspects: Aroma, taste (especially aftertaste), sweetness, chocolaty-ness, and texture. How did we do that? Two key ways: 1) We adjusted the protein blend to improve the texture/grittiness (still the same amount of protein) and 2) We created a more harmonious chocolate flavor that reduces aftertaste, accentuates the chocolate aroma, and allows the chocolaty-ness of the natural cacao to shine. Q: How does the nutrition compare to previous chocolate formulas? A: The nutritional benefits are the same as our previous Chocolate (New Superfood) formula. It still has more fiber, less sugar, and the 4 new Superfoods (Moringa, Coconut Flower Nectar, Luo Han Guo, and Himalayan Salt). Q: How can I ensure that I receive this new formula in my next Chocolate Shakeology Home Direct (HD) shipment? A: No need to do anything! You and your customers will automatically receive the new formula in your next HD shipment. Q: How will I know I’ve received the new Chocolate Shakeology formula? A: Look for the nifty green sticker on the front of the packaging. For the first month or so, every bag will include a sticker that says: “We Heard You. Now Better-Tasting. Customer Approved. Same Great Health Benefits.” We’ve also permanently removed the red and white “New Superfood Formula” flag. Q: What are people saying about this new formula? Q: Will the previous “New Superfood” formula (or the original Chocolate formula) be offered after the week of Dec 17th? A: No. This new, better-tasting formula will replace all prior chocolate formulas after the week of December 17th. This includes both the bag and single-serve packets! A: All packaging forms of Chocolate Shakeology (30-day bags, 24 single-serve packets, and combo boxes of Chocolate/Greenberry) will switch over in all places at the same time. Be sure to ORDER NOW and get it just in time to start 2013 off right! 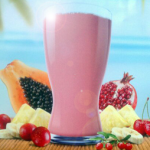 If you dont want to give your body the best nutrition possible…dont order now. If you dont want to feel amazing, have more energy, and you like feeling bloated…dont order. But if you are ready to get back on track with your nutriton with the taste of Shakeology that you love and cant wait to drink. AND COMMIT TO MAKING 2013 YOUR MOST NUTRITIOUS, DELICIOUS YEAR EVER! Select the “Autoship” option on the next page for FREE SHIPPING! SAVE $10.00!